Former concertmaster of Pacific Northwest Ballet, Northwest Chamber Orchestra, Peter Britt Festival, Los Angeles Philharmonic Institute. 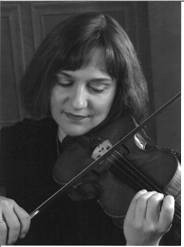 Nationally recognized violin soloist and chamber musician. Teaching in the Seattle area for over twenty years. Concertmaster Emeritus of Seattle Symphony; former concertmaster of Mostly Mozart Festival, Malmö Symphony, Seattle Opera and other orchestras. Internationally acclaimed violin soloist. Former lecturer at the Sibelius Academy, Helsinki, Finland. Masterclasses on two continents. Presently also teaching at the Seattle Pacific University and serving as concertmaster of Rainier Symphony. Every student is an individual, and attempts to teach based on one formula or method will lead to less-than-ideal results. Everyone has his or her strong areas and also weaknesses. We are not trying to mold students to become duplicates of ourselves, but to enable them to develop into unique artists. We have studied under such masters as Heifetz, Galamian, DeLay, Temianka, Bouillon and Odnoposoff to mention a few, and have thorough knowledge of many different schools of violin playing (Auer, Flesch, French and Franco-Belgian). Our violin and viola students have performed exceedingly well, both in college placements and in solo competitions. Many have won auditions for numerous orchestras throughout the world, including principal positions, and some have also become teachers in conservatories. We try to help each student attain their own potential, regardless of career goals. We are also dedicated to teaching adults who feel a desire to return to active playing after having had careers in other fields besides music. We believe in the benefit of regular performance opportunities, including frequent playing classes, and encourage our students to participate in the numerous recitals we offer throughout the year. Some students prefer having one teacher, but many others seem to enjoy studying with both of us and benefiting from the slightly varied approach. We will accept gifted violinists and violists at any age or level, providing they express an earnest desire to learn to play well. Fees are determined by the level of commitment and duration of lesson. Advanced students usually require more time than one hour, yet 45 minutes is possibly enough for the very young learner. For early beginners, we recommend two 30 minute lessons per week. With scheduling, we are flexible in order to accommodate busy parents and children. Our studio remains open 7 days per week. In these challenging economic times it is important keep in mind that the exorbitant fees some teachers charge are by no means an indication of expertise and results. Students who pay monthly will receive a better rate than those attending sporadically. For all sessions a 24-hour cancellation notice is mandatory, except in the event of an emergency. Nothing gives us greater pleasure than observing our musicians grow and develop into more mature, self-confident artists.